• 917 sqft , 2 bath , 3 bdrm – FOR SALE USD339,900 . You don’t live in Hawaii so you can clean a big house and cut a huge lawn NOW DO YOU? NO, you want your coffee on a lanai surrounded by tropical plants. You expect to enjoy mornings at the beach with the kids or deep sea fishing with friends. You envisioned afternoons by a beautiful pool and sunsets watching a green flash at an ocean-side restaurant. 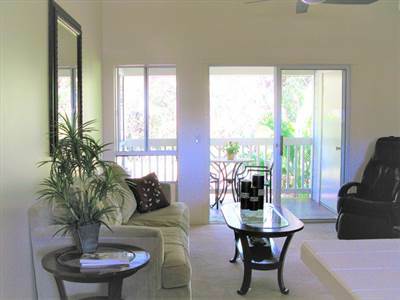 If that is your idea of Hawaiian lifestyle, this charming little piece of paradise may be just perfect for you. Located conveniently, near shopping and restaurants. Two beautiful resort style pools and amenities to enjoy. Three bedrooms and two full baths makes room for family or guests. Cathedral ceilings and open concept plan make the home feel quite spacious. An end unit with extra windows welcomes sunlight and breezes. The cozy lanai overlooks green space Two assigned parking spaces are right out front. Five ceiling fans and 3 air conditioners are included for your comfort. Big closets are upgraded with mirror doors. What could make it better? Well it is clean as a whistle and the furnishing are available outside escrow so you can buy it and move right in. Bring one cat or one bird but no pet dogs allowed. Next Next post: How’s the Condo Market – HOT!